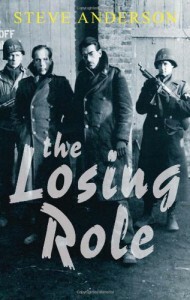 This was an interesting take on the Battle of the Bulge from a German perspective. I appreciate the thorough research Mr. Anderson did in creating this work of fiction. As the victors WWII, it's easy to vilify all things and persons Nazi and forget that many of those who fought were forced to do so, especially toward the end of the war. This story attempts to humanize one such soldier, an actor named Max who had spent some time America before the war and returned to Germany when his American stage career did not pan out, hoping to capitalize on Germany's pre-war prosperity. It took me a while to get fully engaged and really care about what happened to Max. I think I would have come around a little sooner if the flashback scenes had started earlier in the narrative. They provided background information which was necessary to create empathy with Max, and waiting until the story was one third of the way through before giving us any of his history really made the story drag for me.